Car vacuum cleaners, wi-fi, a toilet or just a cup of coffee are on the list for an ideal charging station for owners of EVs (electric vehicles) but most important by far is ready availability. Flip the Fleet, a representation of low-emission car owners, surveyed 108 EV (electric vehicle) owners to identify what makes the ideal charging station. Top priority for respondents was to drive up and plug in to a charger in full working order, without having to queue. Immediate availability was almost twice as important as all the other features desired in a charging station. The survey found that EV owners are on average having to wait their turn to charge on 14 per cent of visits, for an average wait of between nine and 12 minutes. These owners want more chargers installed at the charging station to alleviate congestion. “EV owners do nearly all their charging at home, where it is cheap, convenient and reliable. But it’s also important to have access to rapid chargers on those occasional long trips away from home” says Justin Boyd, a Flip the Fleet participant and co-ordinator to the Waikato EV group. 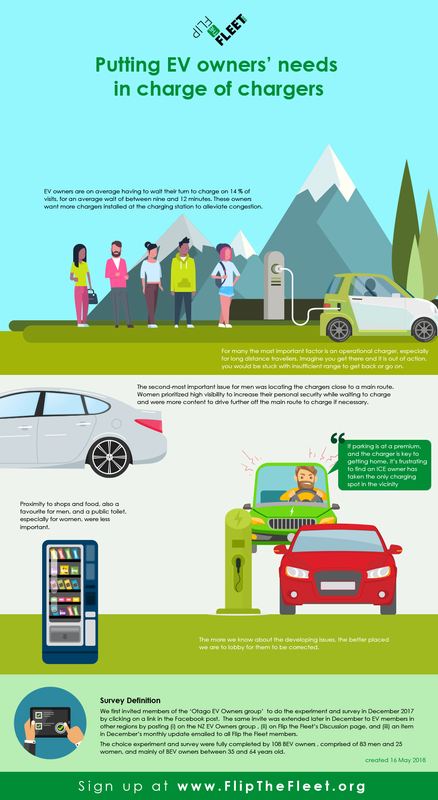 The survey showed that, while long-distance travel depends on creating a network of charging stations every 75 km along the main highways throughout New Zealand, more chargers are needed to relieve growing congestion in the main centres where most EV are driven. After immediate availability of the charger, the second-most important issue for men was locating the chargers close to a main route. Women prioritized high visibility to increase their personal security while waiting to charge and were more content to drive further off the main route to charge if necessary. Proximity to shops and food, also a favourite for men, and a public toilet, especially for women, were less important. A minority want to charge close to a park for the kids or natural areas for a walk, or just to enjoy a good view while their car charges. “I want something to do while I charge,” said a respondent. “Knowing I can get back to my car quickly when required, I stop, go to the toilet, grab a snack, maybe get some stuff for home and then head off.” There is a handy app from ChargeNet that will send a text to the user when the car is fully charged. Shelter from the weather was important, too. Justin Boyd believes education of EV and ICE owners will help to reduce congestion at chargers. EV owners get most aggravated when they get ‘ICEd’. That’s their term for finding that an ICE (internal combustion engine) car has taken the EV’s charging spot. Fortunately, the survey found that ICEing happens only around 2% of the time on average. The exception is Dunedin, where EV owners are blocked from the charger between 6% and 15% of the time. Flip the Fleet is a citizen science project that provides scientifically reliable information on the benefits and constraints of electric vehicles in New Zealand. This survey was partly funded by the Government’s Curious Minds portfolio, and partly by its Low Emission Vehicles Contestable Fund, administered by the Energy Efficiency and Conservation Authority (EECA).